Wyatt Sinclair has been afraid of the dark his whole life because he sees monsters in the shadows. Labeled as crazy, his fear has isolated him from the rest of the world. He lives alone with two cats, works 8 a.m. to 4 p.m. at a 24-hour diner, and his best and only friend is his sister. Stranded and in trouble one night, Wyatt encounters Silas Delano, and the carefully crafted world he has been hiding in falls apart. Silas is brave and strong and he’s not afraid of the things that live in the dark; they are afraid of him. 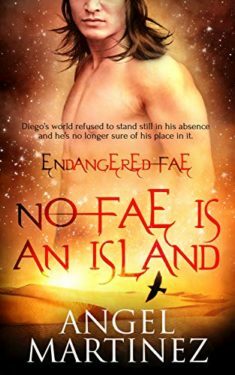 Wyatt doesn’t know how to be like Silas, but a terrible, ancient monster is rising, and it threatens everything and everyone he loves. He can’t run away and hide this time. Can he overcome his fears and embrace who he truly is before it’s too late? This was not what I was expecting going in. I don’t actually know what I was expecting but it wasn’t this storyline. Still, it’s a very interesting UF read. Wyatt Sinclair is a fry cook at a truck stop in a Seattle town, and he (thinks he) sees things that go bump in the night, although he isn’t sure. He’s been like this since a child and no one believes him. When Wyatt leaves his home he always has some form of light with him, mostly torches. At the beginning of the story he’s scared witless of being late off his shift because someone is running late for theirs. There are things either lurking out there or he’s as unstable as they think he is – they being his family and his psychiatrist. Either way, life is not comfortable for Wyatt. He never goes out anywhere, other than work. He has no friends, his sister Kat is a somewhat questionable friend. His family care but they get exhausted with his behaviour. He lives in an apartment with two cats, Benson and Hedges (love their names), both of which he inherited from his aunt Tallulah who now lives and works elsewhere. One night he’s late from work – his nightmare – and the worst possible thing that can happen does happen, his car breaks down on a detour driving home. He’s stuck in the dark on the edge of a forest, panicking. Kat is out of town and when he calls her she makes it clear she’s over having to worry about her brother and his ‘moments,’ hanging up on him. Suddenly a guy wielding a sword comes out of the darkness and a whole new world opens up to Wyatt. Can he accept it, or is it just a further tumbling down the rabbit hole of anxiety, phobias, delusions? I felt for Wyatt, seeing something no one else believes in and being patronised about it, well meaning or not, is difficult. Having constant psychiatric intervention, having no friends, is enough to make you isolated and vulnerable, completely uncertain of life, and the dark where a lot of the things you feel come out to play. Being scared of what you see night after night would take a huge toll. However, when Wyatt meets the sword bearer, Silas Delano, he becomes a tad annoying as more and more about the world he lives in opens up to him. He can be somewhat whiny but he really does develop as a character over the course of the book. I thought he was in his early twenties, his voice seems no older, but some math puts him at twenty-eight. Anyway, it’s pretty real. Who would just leap head first into something like this? Silas is older, in his late thirties, and one tough and enigmatic man. He has no doubts that what he sees is real and he faces it head on, but is there more to Silas than meets the eye? This world can be gory sometimes. Creatures get killed. *Reader advisory/Also Spoiler – If you love cats/pets then this could be problematic as Benson and Hedges are killed. I didn’t like that at all as I’m not good with animals dying in anything I read or watch. I didn’t expect it either. You can skip it because I’ve mentioned it and you’ll be able to work out it’s coming. There are two worlds in this book, one contemporary and one set in the early 1600s. Wyatt is now the keeper of a journal written by a man named John Bledsoe. It was given to him by his Aunt Tallulah, a professor with antiquarian tastes who also writes unusual anthropology papers. The things that are happening now seem to be mirroring events in the book around John Bledsoe and the timeframe of 1610, as are the dreams Wyatt is increasingly having about a snake, the Midgard Serpent. The world building in this book is good. Even though this doesn’t have series next to its title, it really has to be the start of more. There is a slow development of some arcs and Wyatt’s character, the primary narrator, although occasionally John Bledsoe is the epistolary narrator via his journal entries. There is no steam in this book. Wyatt is gay, he has a crush on Silas but that’s it. I don’t even know if the feelings are reciprocated, although Wyatt does throw his feelings out there. I’m not sure whether that aspect of the book is going somewhere in a series or not. The ending is either meant to be abstract, it can be left as is, but I hope it isn’t, or the beginning of a series. J L Aarne isn’t conventional or prolific as a writer, so who knows? Optimistically, I’m voting for more coming because there is much more that could be extrapolated, and there are some potentially great characters who need extra page time. Especially Thorn, the literal monster under the bed, who is gentle and anything but monstrous, although it seems Thorn is very old and reticently knowledgeable. Yep, Thorn is definitely at the top of my list of something I want to know more about and see more of. Then there’s the gnomes Carl and Louie who hold such a respectful and touching funeral for Benson and Hedges. Other characters include Amarok the wolf and Herschel the minotaur. Plus the vanguard, the warriors who are the first defence against the Night, which is only just being explored. The goings on in 2018 mimicking John Bledsoe’s experiences in the 1600s continues to ramp up as the plot moves forward and timelines oddly and interestingly intersect. There’s also the black-eyed ‘children of the corn’ happening, and they aren’t restricted to the night. I can’t talk about it but there is quite the unexpected twist, I seriously did not see it coming. All of it just makes me need to know what’s going to happen next. J. L. Aarne is a good writer, especially for people who want something a bit darker, a bit different, and on the queer side. Night People is good UF reading for anyone who’s looking. I think you’ll like this one, Paul. Be interested to see what you think. It has to be book #1 of a series. This looks like the nice beginning of a series if it is, in fact, going to be a series. I felt sympathy for Wyatt right off. I’d be curious to see if there’s another story behind it. What you said in your spoiler is disturbing, however. I’m sure other readers will appreciate the warning. I hope there will be another book after this one, I truly do, but I’m still waiting for the next book after I hear They Burn for Murder. Great writer though, just not prolific.